Green Goddess Pasta Bowls are a healthy and delicious main dish recipe. It's made with a pesto-like sauce, roasted green veggies and pasta of your choice. 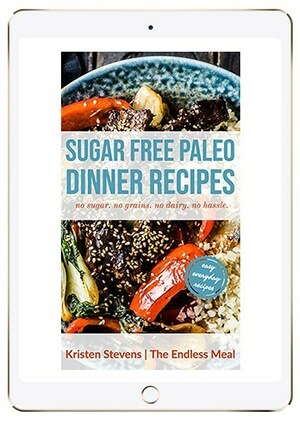 Choose your favorite protein to make this a paleo or vegan-friendly meal. I know it's not quite the new year yet, but I'm already starting to crave healthier foods. I'm blaming it on the five thousand Christmas cookies I ate in December. You guys ready to lighten things up a little? I've made us some Green Goddess Pasta Bowls that are super flexible to alter to your diet and mood. They're also crazy delicious and don't leave you feeling like you're missing out just to be healthy. If you had a look at the pic, you'll see I seared some healthy, oil rich salmon to top the pasta. If salmon is not your thing, you can top this with your fav protein. Use tofu to keep this vegan, or kick it up paleo-style with some sliced steak. You can also switch up the pasta, again depending on your diet and your mood. I've used nutty tasting Kamut pasta in the pictures. You can make your green goddess pasta with regular, whole wheat, or zucchini noodles. Making your green goddess pasta isn't tough, but it does involve four steps. If you follow the steps in order and don't wait for one to finish before starting the next, your dinner will come together in about 30 minutes. 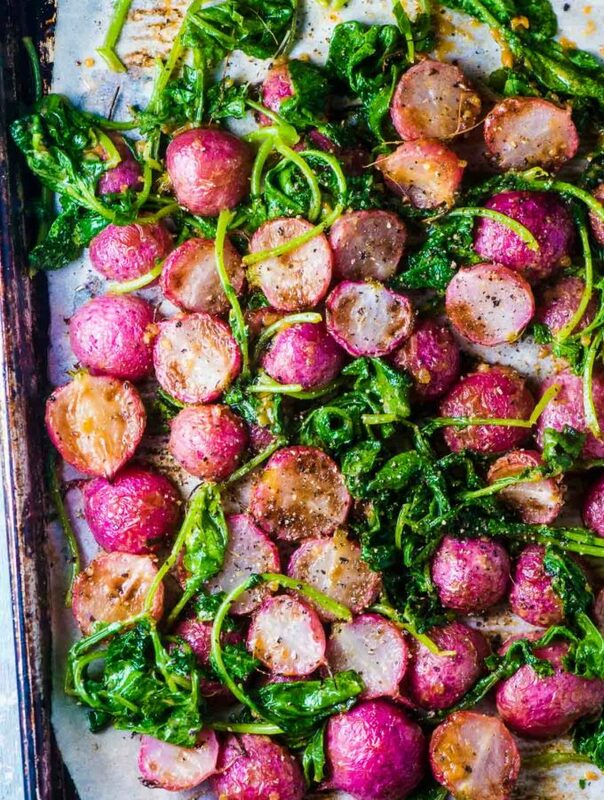 ♡ Put the veggies in the oven to roast. 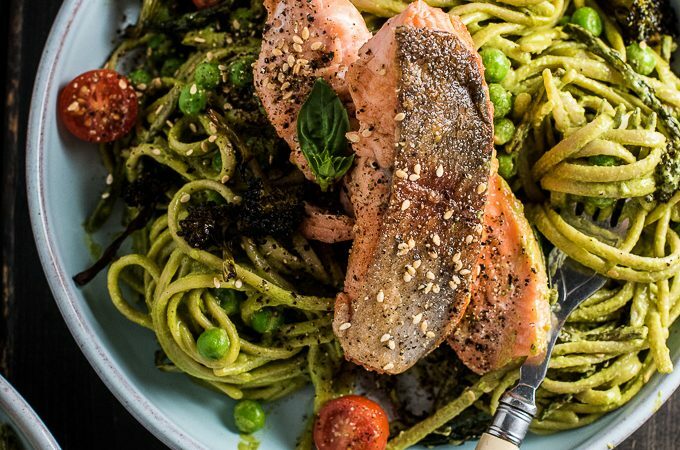 ♡ Make the extra green pesto sauce. ♡ Put water on to boil and cook the pasta. Did you see how ridiculously easy that was? Once you do those four easy steps, you toss everything together and eat. Trust me, you've got this. 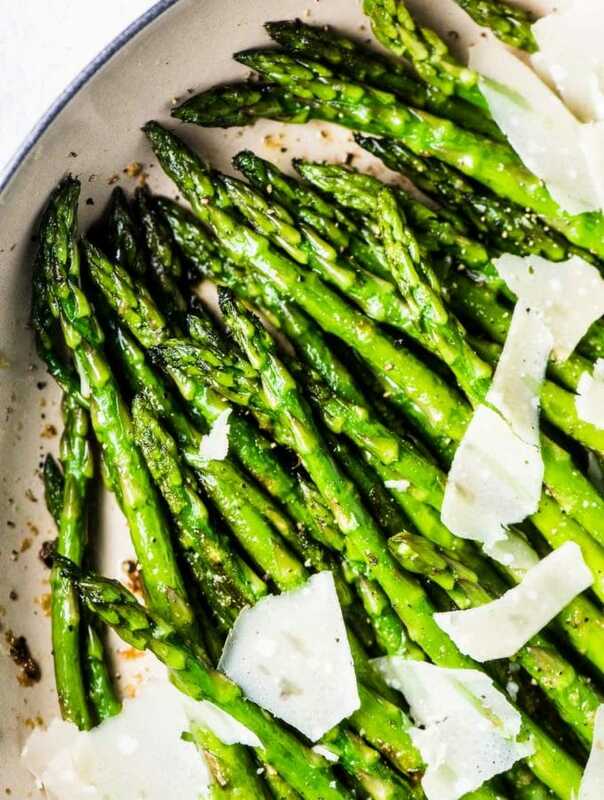 Place the broccoli and asparagus on the baking sheet, drizzle the olive oil over top and sprinkle a pinch of sea salt. Place the broccoli and asparagus in the oven and roast for 25 minutes, or until cooked through and starting to brown. While the broccoli is roasting, make the green goddess pesto. Place all the pesto ingredients in your blender and blend on high until smooth. Taste and salt as needed. Put a pot of well-salted water on to boil and cook the pasta according to package directions. In the last minute of cooking, add the frozen peas to the pot. Reserve 2 cups of the pasta water and drain the rest. Place the pasta back into the pot. While the pasta is cooking, sear your protein on medium-high heat in a lightly oiled pan until cooked. Pour the pesto over the pasta and toss. Add the roasted veggies to the pot and toss again. Plate the pasta and top with the seared protein. Use zucchini noodles to keep this recipe paleo. Add the zucchini noodles and peas to a pot of boiling water and blanch for 1 minute. You can use tofu, fish, chicken, or steak, depending on your diet and preference. This sounds like a quick, delicious, weekday meal. Thanks! Oh my gosh this looks so frickin good!!! I love that it can be topped with whichever protein I want 🙂 I’d put tofu on mine and steak for my husband! Perfect weeknight dinner.